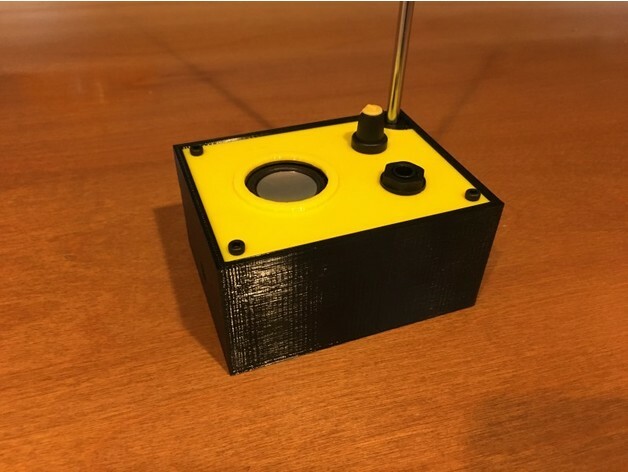 DIY 3D printed Theremin #3DThursday #3DPrinting « Adafruit Industries – Makers, hackers, artists, designers and engineers! This is a 3D printed case for a simple, pitch only theremin design known as the “Thierrymin”, named after its designer Thierry Frenkel. The schematic and instructions can be found over at Theremin World at http://www.thereminworld.com/Forums/T/29231/my-new-year-gift-to-tw-a-new-theremin-circuit?Page=0. I have included Thierry’s schematic on this page, but strongly encourage you to head over to the thread linked above for more assembly and tuning instructions. This is a really simple circuit to assemble, and a lot of fun to play with. I have also added a small 2W speaker and an LM386 amplifier. I have also included a schematic showing how this amplifier is wired.